Opens a dialog where text can be entered that will be displayed on devices which cannot display images. 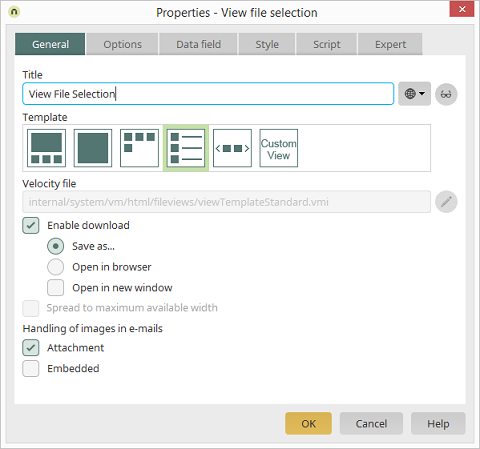 In this area, you can select templates for the presentation of the files in the browser - as is the case with the File selection element. In this case as well, if you select the "Custom view" template, you can use your own Velocity file for the presentation. Opens a dialog where a Velocity file can be selected that should be used as a custom template (custom view). Users can download the files with this option. Users can save the files after downloading them. Users can open the files in the browser after they've downloaded them. When the file is opened, it will open in a new window with this setting. Adjusts the width of the element to its surrounding elements. This setting is only available if the template highlighted in red is selected. Images from the File selection will be treated as an attachment. Click here for more information about the additional settings.